This is a hexagonal countertop display case. A mirrored deck reflects light back into the display case. Along with the two halogen top lights this allows customers to easily view the items displayed in this countertop display case. There are three tempered glass adjustable shelves. Tempered glass is a safer and more durable alternative to standard glass. The adjustable nature of the shelving is perfect for customizing this display to meet your specific needs. This hexagonal countertop display case is available in all standard finishes and custom finishes are available upon request. 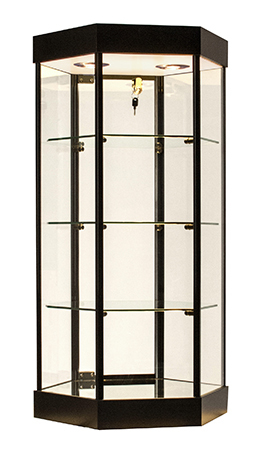 Matching pedestal (with or without storage) Dimensions 18.5" x 16" x 35"
This is a highly versatile display case and can display many types of items from jewelry to figurines. It’s convenient countertop design allows for an optimal placement in your retail space.